It’s no exaggeration to say that cheeseballs speak to my soul. 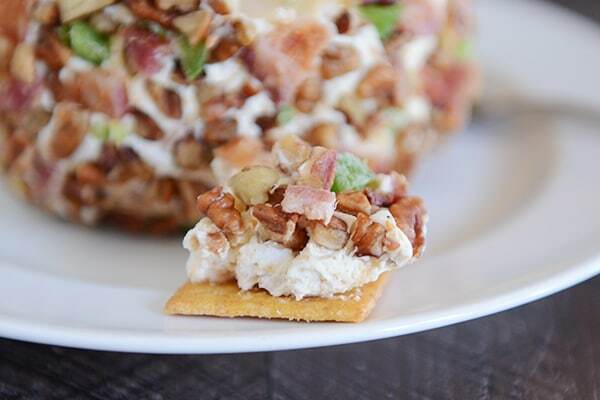 They are my favorite appetizer/snack during the holidays. I suppose I could enjoy them year round but for some reason, they just don’t hold the same allure in, say, July. But December? Bring on the cheeseballs. I have a classic, go-to cheeseball recipe that has wheedled its way into our gift-giving regimen for neighbors and friends for many years in a row. It’s my father-in-law’s recipe and it’s superb. But. You know. Sometimes when you love something that much, you gotta change it up a bit. 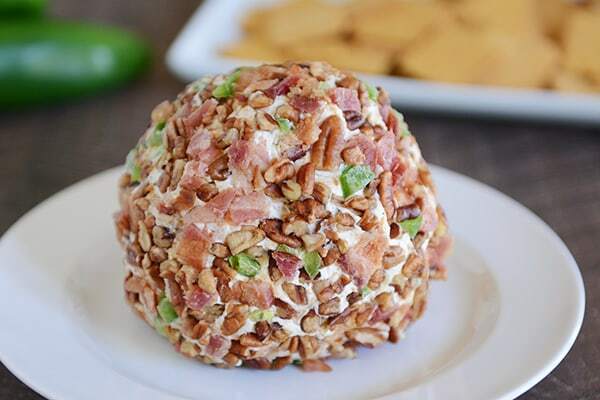 And this bacon jalapeño cheeseball has completely stolen my heart. As a little sidenote, apparently in my brain, cheeseball is only one word and it always has been. Even when I call my brother a cheeseball for saying something nice to me and making me happy cry, I think of it as one word. Cheeseball = one word. But when I google “cheeseball” it seems as though the other 99.9999% of the world views it as two words. Hmmm. Where have I been? Now I’m curious, are you a one-word cheeseballer or a mainstream two word cheeseballer? I’m feeling a little self-conscious about it all, I’m not going to lie. Anyway, this cheeseball (cheese ball) is fantastic. 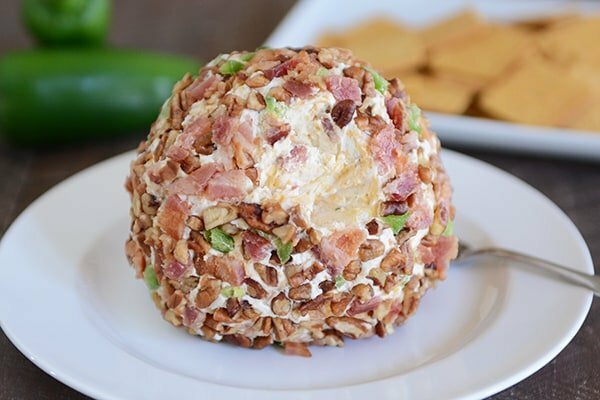 All that creamy and sharp cheese wrapped up in bacon and jalapeños…that’s some kind of cheeseball perfection. In a large bowl (or in the bowl of a stand mixer fitted with the paddle attachment), mix the cream cheese until smooth. Add the cheddar cheese and mix until just combined. Sprinkle garlic powder, cumin, parsley, pepper and Worcestershire sauce over the cheese mixture and mix until thoroughly combined. With lightly greased hands, pat the cheese mixture into a ball. In a shallow dish, toss together the pecans, bacon and jalapeños. Roll the cheeseball into the mixture, pressing the pecans, bacon and jalapeño lightly into the the cheeseball as you go. Place the cheeseball on a plate and refrigerate, covered lightly with saran wrap, until ready to serve. This cheeseball can be made and refrigerated, covered, for several days in advance. Cheeseball. One word. What does spell-check know anyway? That looks like a delicious cheeseball! Can’t wait to try it. 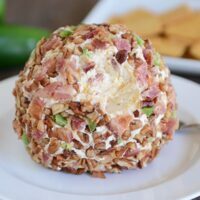 This was the first cheese ball I’ve made and it was surprisingly easy and fun to make. It was delicious and didn’t last more than 15 minutes on Christmas Eve! Next time I’m making two! I was right. Super delicious at my ugly sweater party!! Everyone loved it! I took it to a church youth activity yesterday. There were 60 girls and 15 women. It was a Christmas lesson/party and all of the leaders brought various treats. It was hands down the best thing there!!! Everyone wanted the recipe. The girls kept saying, “The cheese ball was the best thing here!!! You have to give my mom the recipe!!! !” and, “That is the best cheese ball I have ever tasted!! !” (Go bacon!) One short cut that I made was with the bacon bits. I used a bag of bacon bits from Costco and fried them up till they were crispy. (My sister in law’s trick.) Thank you for the recipe! It was wonderful!!!!! I don’t care how it’s spelled. I just want to eat it! 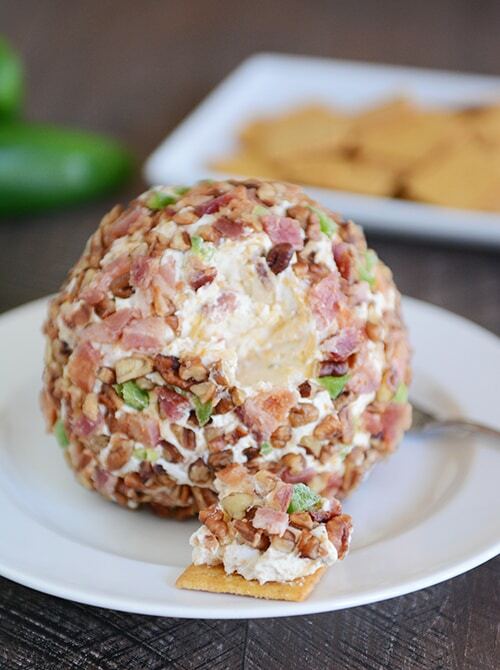 This cheese ball looks incredible! I love anything with jalapeno, so this needs to be made in our house asap. I know what I’m making for Monday night’s ugly sweater Christmas party. Looks so yummy! I am a friend, maybe not quite a neighbor, but I am sure that it is cold enough outside that you could send this to me and it would still be delicious when it got here. As for Cheese Ball or Cheeseball… I guess it depends on how quickly I write it. it do it both ways. You had me at cheeseball. This looks so good! And I say yes on one word: cheeseball! I want to make this for our family party but my sister hates nuts. Not being very creative, what would you suggest in place of nuts? Some type of crushed cracker or nothing at all? Hmmm, I’d probably just cover it with bacons and jalapeños in this instance. This sounds delicious. I am one word girl. Bring on those cheeseballs! I vote one word. Cheeseball. Two that is just silly! I’m getting your cheeseball made for my family Christmas dinner, I’m doing the six sisters idea of mini size, which I thought was just adorably genius. Now that I’ve seen this post, I’m totally going to roll the balls into different toppings. Cheese, different nuts, bacon and jalapeño pretty much the most amazing idea ever! Hello bacon! Oh how I love thee! Thanks for making me a rock star, yet again!